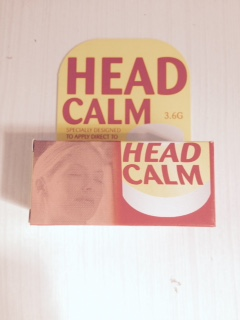 Head Calm a soothing balm in a stick (similar to a deodorant stick) and applied to your forehead to give relief from Migraine and Headaches. No Tablets. 3.6g. Only £3.95. Handy to keep in your bag when travelling . Ingredients include Propylene Glycol, Aqua, Sodium Stearate, Menthol.